Stencils can be prepared at home using household or craft supplies. A stencil is a template with an outline of the positive area cut out. Paint will be transferred to your surface through the outline; the plastic area of the template forms the negative space, blocking paint in those areas. Stencils can be formed from simple images and the templates provide a sharp edge for the design. Airbrushing allows for more precise control over the paint application and is convenient for detailed work or small surfaces. Print your desired image on paper, making sure that it is a simple outline. 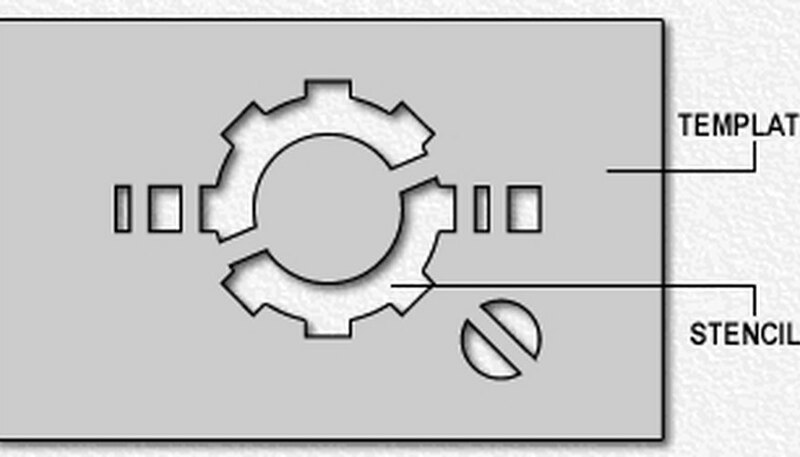 If the desired image is not an outline or a stencil, draw an even outline above and below the lines of the main image, taking care to draw connecting tabs for the internal, negative space (see image for an example). Lay the paper over the plastic sheet and align the corners as necessary. If desired, lay both pieces over a thick cardboard backing to protect your work surface and secure the sheets in place with push pins inserted into each corner. Trace your outline using your craft knife, pressing gently through the paper to cut the image into your plastic sheet. Remove the push pins and paper to review the cut image on the plastic template. Remove the plastic sheet and add refined cuts to the outline as needed so that the outline image can easily be removed. Position your stencil template on the desired surface and secure with tape or adhesive as desired. Airbrush the exposed (open) area of your stencil. Check the lines of your stencil template by airbrushing a sample surface first. After each use, clean the paint from the template to avoid accidental transference of paint to your surface. Consider creating a layered or multicolored effect by creating a progressive stack of stencils; use one plastic sheet for each layer or color. Be careful with the sharp blade of the craft knife to avoid injury or damage.